Charles Tudor began his design career as a staff artist for the Cleveland Press. He was twenty years old, a graduate of the Cleveland Art School and the year was 1923. After three years at the Press he obtained a leave of absence to study in Paris. His employer thought it was for four weeks. Tudor intended on staying a year. He returned from Paris after five weeks and joined the New York Telegram in Cincinnati. Tudor was fired from the Telegram by the police reporter about whom Tudor said, “I don’t think he liked my work.” Broke, Tudor returned to Cleveland and in 1930 took a job as staff artist with Parade, a short-lived publication based in Cleveland. Tudor was dedicated to his artistic ideals and his journalistic ethics. His ambition was to be a painter and as much as his pursuant career was to demand from him, he continued to do pictorial work in oils and watercolors. He was also a man dedicated to his humanitarian ideals. During the depression years of 1935 and 1936 he went to work for the Rural Resettlement Administration in Washington. Along with Roy Stryker and photographers Dorothea Lang, Walker Evans and Carl Mydans, Tudor created a vivid and compassionate picture of rural poverty. His experience in Washington was significant in another way. He worked with an extremely talented group of writers and artists, all of whom shared a conviction that their talents could affect a positive change on American society. Writer John Fischer went on to become editor for Harper Magazine. Artist Aurelius Battaglia became one of the first illustrators for Disney Studio and Robert Thorpe and Carl Mydans went with Tudor to the newly formed LIFE magazine, Thorpe as editor and Mydans as photographer. Tudor worked on Vol. 1, no. 1 of LIFE magazine in 1936. He was to remain at LIFE for 21 years. He did not, however, indulge himself in the security that LIFE offered. For a two-year period, Tudor took risks and accepted challenges that he felt worthy of his time and skills. Between 1939 and 1941 he was art director for a new venture newspaper called P.M., art director for En Guardia, published by the Office of Inter-American Affairs, and art director for the Office of Emergency Management. Tudor returned to LIFE the day after Pearl Harbor was bombed. In 1945 he was named art director and by 1955 he had, literally, changed the face of the magazine. In 1947 he began what was to be an eight-year project to design and manufacture a new typeface for LIFE. It would be an exclusive type that could accommodate the existing format and enhance the bold photojournalism that was the mark of the magazine. Tudor had thousands of existing type styles from which to choose but dissatisfied with the selection, he decided to design the type himself. The manufacture of LIFE’s new face was beset by production problems, which Tudor doggedly battled and won. Tudor’s first idea, for a style in which each letter graduated into seven width sizes, had to be shelved when production cost estimates ran to a quarter of a million dollars. But even with a more easily produced face in tow, Tudor was turned down by foundries and type manufacturers backlogged with post-World War II orders and not amenable to receiving no royalties or resales. Finally Tudor worked out an arrangement with Ed Rondthaler and Harold Horman, type engineers who freelanced with the Lanston Monotype Machine Co. in Philadelphia. Tudor, Rondthaler and Horman tested various sizes, measured for uniform impressions and ironed out technical problems. Even after all specifications were met, it wasn’t until 1954 that the production go-ahead was granted by LIFE general manager, Arthur Murphy, Jr. The six to 60 pt. sizes were manufactured at a rate of one size per month. By 1956 the complete range was ready. Tudor Gothic made its debut as the body text accompanying the much acclaimed “Family of Man” photographic essay in the February 4, 1955 issue of LIFE. It was permanently incorporated into the magazine’s table of contents format in March of the same year. The changes in printing technology that LIFE pioneered, such as high-speed rotary presses, simultaneous printing on both sides of coated stock, high-temperature ink drying and automatic stitchers and trimmers, presented constant challenges to Tudor’s art direction. With the advent of the portable 35mm camera, LIFE was the first magazine to make use of it and new techniques in printing and papermaking. The result was the reproduction of photographs of unrivaled quality for a mass-produced magazine. Charles Tudor helped to usher in a new era of photojournalism. He worked with photographers on the caliber of Ernst Haas, Eliot Elisofon, Mark Shaw, W. Eugene Smith, Margaret Bourke-White and Gordon Parks. Tudor’s work was not confined to the weekly pages of LIFE. A story on the Sistine Chapel for which Tudor experimented with a dozen printed colors rather than the usual four, was copied and incorporated into the Vatican exhibit at the 1964 World’s Fair. It was also featured in the reception center of the TIME-LIFE building. Because LIFE was not strictly a reporter of news, Tudor was also involved with interpretive photo-essays and illustrated articles that required both the newsman’s skills and the artist’s vision. Tudor may well have been the most-seen art director in America. By 1946, LIFE had the highest mass circulation of an American weekly: 5,200,000 paid circulation and 22,500,000 readers. To his co-workers and friends, he was known as Charlie. He could ruffle feathers if he deemed it necessary yet the targets of his outbursts understood that it was a compliment. Charlie never wasted his anger on people not worthy of it. The other side of Charlie was relaxed, humorous, pleasant. Carl Mydans saw him as the calm in the midst of a storm of temperamental artists, territorial writers and crushing deadlines. Between 1949 and 1959 from the Art Directors Club alone, Tudor won five Club Medals and ten Awards for Distinctive Merit. He continued as a contributing artist to The New Yorker, Town & Country, and Parade magazines. He was a designer for Standard Oil’s magazine, The Lamp, and for Vision, a Spanish language magazine. He designed several books: Margit Varga’s Christmas Story (1946), American Past by Roger Butterfield (1947), LIFE’s Picture History of Western Man (1951), The World We Live In (1955), The World’s Great Religions (1957),Wonders of Life on Earth (1960) and LIFE’s Pictorial Atlas of the World (1961). 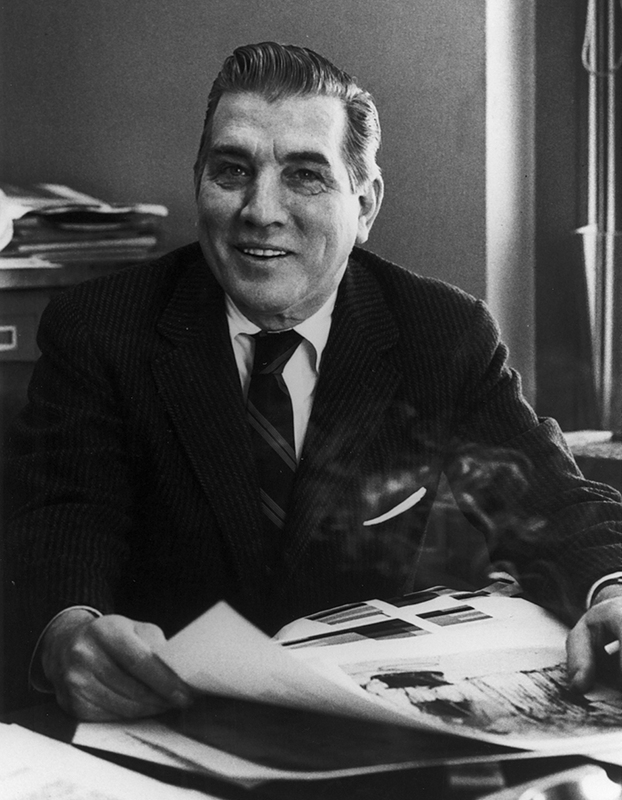 In 1961 Tudor was promoted to Director of Quality Control in Corporate Production, responsible for the quality of printing and reproductions in TIME, LIFE and Sports Illustrated. In 1970, five years after retiring, Charles Tudor died. He was 66 years old and had accomplished a great deal. Please note: Content of biography is presented here as it was published in 1985.